Daniel and Beatrice Cook are no ordinary children, they are attending a school where you learn about dragons, led by the great dragonolist Dr Ernest Drake. In dragon school, they learn about everything and anything to do with dragons, and the best part is they get to see real life dragons. But there is one bad thing. An evil man named Ignatius Crook, his partner in crime Alexandra Gothyryk(or something like that!) are trying to gain the rank of dragon master, the highest rank of dragonology there is. So can they rule the dragons? Can Dr Drake along with Daniel and Beatrice stop him? Find out in the first book of the dragonology series. Septimus Heap, extraordinary apprentice is about to enter his most dangerous week yet. You might think he has gone through quite a lot already, but nothing can compare from what he is about to face, and what he is about to face is... his Darke Week. But while he is preparing, a powerful force is growing in the castle, wreaking havoc, and smothering every light in it's path... and to make things even worse, Marcia has accidentally Banished Alther to the Darke Halls. Can Septimus and crew get rid of the powerful Darke force, and find and defeat the culprit, and rescue Alther, and pass Septimus's Darke Week as well! Find out in this magical (or should it be magykal? :) ) adventure in the 6th (but no worse!) book. Its summertime and hurray, schools over! Summer holidays also means the summer reading challenge is on. Run by local libraries, the theme this year is Creepy House. Shrewsbury library is dressed up as a creepy haunted house in the children's section and it looks great. What you have to do is read six books. You need to register at the library and they give you the information. Every time you read two books, you can go to the library and collect your reward. The first reward is some smelly stickers which are really revolting and a book mark. For the next two books you read, you get more smelly stickers and a chatterbox, and for the final two books, even more smelly stickers, a certificate and a medal. When you have all of these then your reading challenge is complete. I think its a really good way to get children reading because they can be rewarded for it. I strongly recommend you get down to your local library and sign up. Who knows, you might end up liking books as much as me! Good luck and enjoy the summer holidays. When I got there Hilary and Tracey (no relation in case you were wondering) welcomed me and gave me a signed copy of The Faire Glen. Then (naturally) I started to look at the books the shop had. Eventually I chose on 2 books. 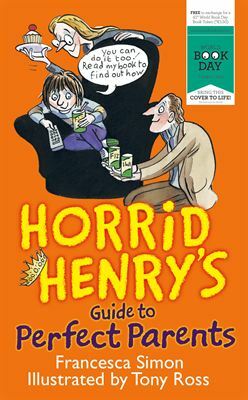 How to Train Your Dragon and Horrid Henry, a guide to perfect parents. 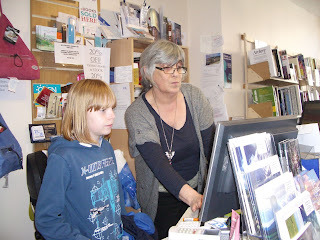 When I was paying for my books the owner of Burway Books invited me to go behind the till to show me how everything worked. After that I went back to look at the other books and found another one I liked. It was a bumper pack of Harry Potter books, but sadly I couldn't afford them. It was my birthday last week and I was spending my birthday money. 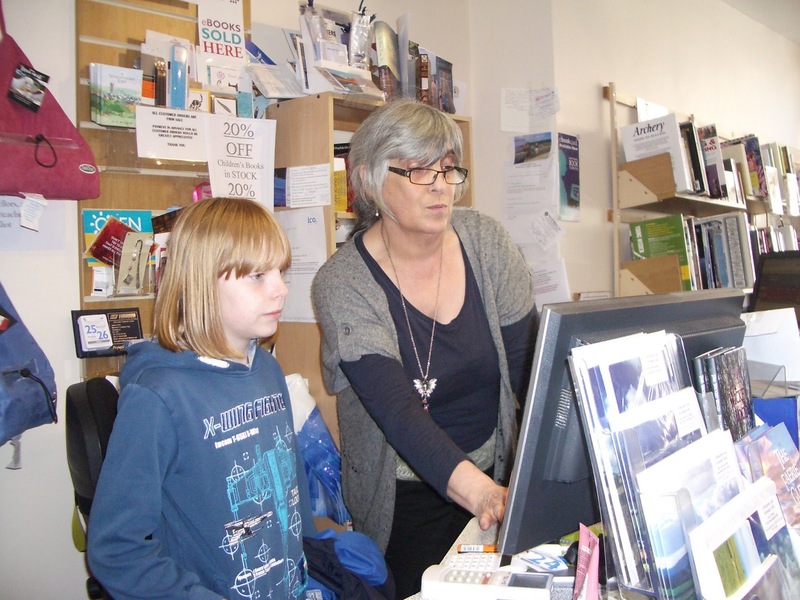 After browsing the range of books I asked some questions and had some photographs taken. I was there several hours there but it seemed like minutes (it's true what they say, time flys when your having fun) It was time to go, but my treats were not over yet. My mum had bought me a bumper pack which had The Hobbit, The Lord of the Rings, The Fellowship of the Ring, The Two Towers and The Return of the King so to put a long story short, it was fantastic!!! I have loads of books to keep me going so I will review them when I have read them. World Book Day is the biggest celebration of its kind anywhere. Millions of books vouchers are given away to children to either swap for a book especially written for World Book Day, or to put towards another book of the child’s choice. On this World Book Day we were lucky to have a visit from Catherine Cooper. 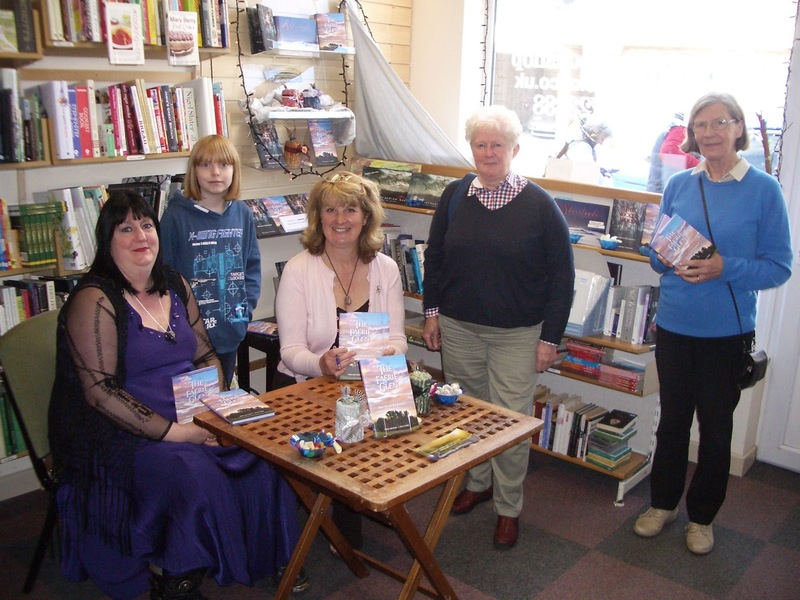 She is a Shropshire author who has written a series of fantasy books for children. The first one is called The Golden Acorn. Catherine came to St Thomas and St Anne’s school to tell class 3 all about her books. First she introduced us to the main characters, Jack Brenin (a young boy), Camelin (a raven who used to be a boy), Elan (a girl) and Nora (a lady who can do magic). Catherine told us how she thought them up from people she had met in real life. She brought some of the characters as dressing up costumes with her and some of class 3 got to dress up as them. The atmosphere was funny and exiting and everyone enjoyed her visit. Finally we were able asked her questions about future books and what she has planned. The day finished with Catherine selling copies of her books which lots of students bought. In my opinion she is a fantastic author and I have enjoyed reading the Jack Brenin series and can’t wait for the next one. Just thought I would let you know what I've been to to this year. 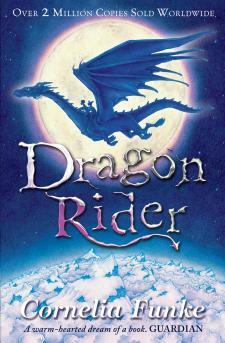 I'm reading The Dragon Rider which is over 600 pages long so it's going to take me a while to read. I'm a librarian at school now along with some other children. This involves helping children choose a book, then when they've chosen it I stamp it for the return date. When the books are returned I put them back in the right place on the shelves. Don't worry I am still doing the blog but I'm very busy so it's been hard to fit time in. Sometimes the books take a while to read so I'm not going to be able to write a book of the week every week, but please keep checking in every so often to see if there is a new post. I also like receiving comments on my blog, so please feel free to leave a comment or any book recommendations. This is the sequel to The Golden Acorn (the first one) and I got this one and number 3 and 4 for Christmas. I've read this and now I'm onto number 3! Jack and Camelin have recovered the last three cauldron plates from ancient Rome and they've gone back to the present from the past, but there is one small problem, they can't find them! Even if they can find the missing cauldron plates will Nora have enough magic left to open Glasruhen Gate into Annwn and recover the Hamadryad acorns? Fun, adventure and magic all in one great book.